The Math Activity Theme Series currently includes Bat Math and Spider Math, just in time for October and Halloween math activities. Each page is a collection of current Mathwire.com activities, but some new activities were developed for each collection, so be sure to check each page carefully for both new and old themed activities. For example, the Bat Math page has a new Fat Bat Game and some new bat problem solving tasks. Check out the Pasco and Kennewick School Districts site for more math songs written to popular tunes that might help students remember math facts and concepts. Browse the Math Songs and Chants. Now you can search the Mathwire.com site by NCTM Math Standard in addition to the alphabetical search. Notice that the Math Standard search option is present in the upper right of the Home and Archives pages for your convenience. Halloween masks become a math activity when students create Symmetric Faces. Students demonstrate a working knowledge of symmetry as they make these unique masks using 1.5 sheets of construction paper, scissors and glue. 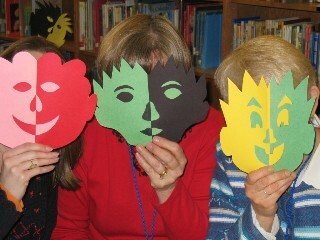 View the Photo Gallery for inspiration and download directions for making Symmetric Faces. Resources on this page include pictures, descriptions of different teachers' practices, templates and links to online resources. 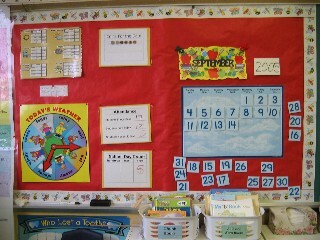 There are also links to the Mathwire.com Morning Math Routines page, which describes each routine in detail, and the Morning Math Routines: Photo Gallery, which is a collection of actual classroom pictures. Check out Math Routines Resources to view the pictures and to download templates.